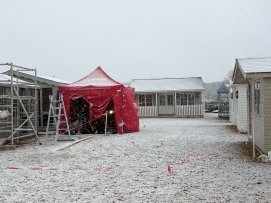 The first few weeks of 2017 have been busy ones here at our HQ in Norfolk: five new buildings have been installed on site, with work continuing through the snow at the end of last week too. 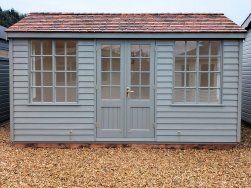 3.6 x 4.2m Salthouse Studio: This Salthouse has been painted in Farrow & Ball’s Down Pipe, it has double doors in the front and it has been finished in our painted matchboard lining on the inside. 3.6 x 3.6m Wiveton Summerhouse: This is the largest size of Wiveton we make, and it’s very nice to walk inside and realise just how big it feels. It has been painted in Valtti Cream for a bright finish, and there is painted matchboard lining on the internal walls. 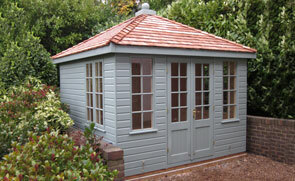 3.0 x 4.2m Holkham Summerhouse: This is our new-style Holkham, and we’re delighted to be able to show it off at our HQ at last. It has Georgian windows, weatherboard cladding and it has been painted in Valtti Ash. 3.6 x 4.2m Langham Studio: Painted in another of our new Farrow & Ball colours, Green Smoke, we’re really pleased with how this Langham looks. It is finished in our natural matchboard lining on the inside, and there are also two Velux® windows in the roof to allow extra natural light inside. 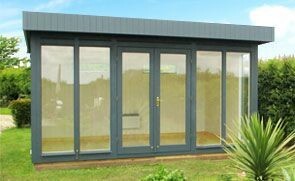 3.6 x 4.8m Garden Room: Show casing inset doors, corner boards and an electric pack, the Garden Room is a grand edition to our show site. Farrow & Ball’s Pointing has been used to paint the outside, and the inside has got painted matchboard lining on the walls, and a natural lacquer on the floor. For more information on these new buildings, you can see their full specifications here. You can also call us on 01760 444229, or come and see the buildings for yourself by visiting us here in Norfolk.